In what seems to be an obsession with consistency taken to extreme, writers and editors continue to ask the CMOS Q&A whether it’s OK to edit quotations from published works “for consistency” with Chicago (or MLA or AP) style. Let me try to understand why someone would want to do that. Is it a fear that even though quotation marks make it crystal clear that a text is being copied from a different source—that is, by a different writer, publisher, editor, and perhaps from a different time zone or even century—readers will be surprised and offended that it wasn’t somehow miraculously copyedited according to the same style sheet as the current document? Is it a personal tic, like a need to match one’s handbag and shoes, or like buying a painting that goes with the sofa? Is it a belief that some hallowed goal of “consistency” can justify changing someone else’s published writing? Quotations must retain the original styling. Think what would happen to scholarship if everyone who quoted an original text felt free to tweak the capitalization, change a few commas to semicolons, and impose British spellings—each quoter in a different way. Remember that old game called Telephone? Scholarly integrity aside, capitalization and spellings are personal things, and sometimes political or religious. Someone writing about God does not want you changing he to He or vice versa. When you mess with a quote, at best you misrepresent the writer; at worst, you introduce inconsistencies yourself. It’s unprofessional and unethical, if not criminal. It’s possible that this drive to tidy up quotations from sources that failed to follow your style book is an overly eager extension of the accepted practice of changing the capitalization of book and article titles so they are consistent throughout a document. But titles of works are entirely different. Editors don’t always have access to the original in order to check the casing. Even if they do, titles often appear in all caps or in more than one way between the book cover, the title page, and the Library of Congress listing, not to mention in reviews or at online bookstores. Standardizing titles is a long-standing convention. It’s not personal. One of the first tenets of editing is to render quotations accurately, following the original. If you are a writer or editor and are still confused about that, please seek some informed leadership. Take a class. Hire an intellectual property rights lawyer to give a workshop. Read The Chicago Manual of Style, chapter 13. 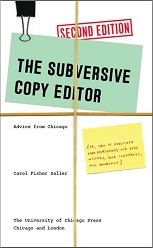 Read Amy Einsohn’s The Copyeditor’s Handbook, chapter 8. Read The Publication Manual of the American Psychological Association, chapter 6. If you still have questions, well, there’s always the Q&A. Last week I wrote about what writers can expect when their manuscripts are edited on screen with the changes tracked electronically. This week I’ll explain what a copy editor can expect from writers in return. More and more often, the editing stage of a book or journal article headed for publication is entirely paperless. Copy editors work on screen with the use of the tracked-changes feature of their word processor, and writers receive the edited version either as an e-mail attachment or as a link to a site where they can download it. Depending on the amount of editing and the word-processing skills of the copy editor, the results will be more or less easy to read and respond to. In this post, I’ll discuss how to look at redlining and what you can reasonably expect from a copy editor who works in this fashion. What’s So Hard About Reading a Cover Letter? Honestly, what is it about writers of scholarly books that makes 33.4 percent of them* think they’re above reading instructions—never mind following them—when they receive an edited manuscript or page proofs? Don’t they ask their students to follow directions on exams? Don’t they sit on dissertation committees that require conformity with a set of instructions? Haven’t they been told since kindergarten to follow the rules? In response to my invitation to send questions, Albert in Indiana asked about the relative merits of endnotes and footnotes in books. Mr. Meyer prefers footnotes, which allow him to “converse with readers,” over endnotes that “require leafing backward and forward through the pages.” In general I agree—but there are other considerations.